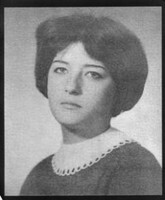 Pennie L. Beck, 32, of 4385 Camille Drive, died June 3, 1977. She was born February 19, 1945, in Salt Lake City, Utah, to Jack W. and Beverly Faye Guest Smith. She was married and divorced. Pennie is survived by her parents of Salt Lake City; her son and daughters, Hether Machelle, Stoney David, Heidi Marie, all of Salt Lake City; and her brother Michael W. Smith, Salt Lake City. Funeral services will be held Monday, June 6. 1977, 2:00 p.m., in the Russon Brothers Mortuary Chapel, 255 East 200 South, Salt Lake City, where friends may call one hour prior to services Monday. Interment will be at Mt. Olivet Cemetery. Click here to see Pennie's last Profile entry.